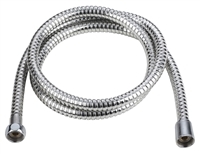 The shower hose kit is an Eco-friendly product made of 79 inches of high quality (304) stainless steel hose, heat & chemical resistance TPE (Thermoplastic Elastomer) inner hose, brass nut and core with chrome surface and a chrome holder with brass joint. Our shower hose kit has been improved and upgraded with Eco friendly materials. The shower hose fits to any handheld shower head or fixed type shower head with 1/2 inch thread. A fixed type shower head can be replaced with a hand held shower head with this shower hose kit. Please makes sure there is a rubber washer in between the holder and the shower arm. · For a fixed type of shower head to be replaced with a hand held shower head.